The stocks ended more-less unchanged on a week, while The volatility decreased to almost pre-February levels. Trade negotiations with China presume and interest rates are under control – these elements may drive volatility in the upcoming months. Thus, it is important to follow a big trend and focus on fundamental values of the stock market. Well Well Well, as anticipated in market review – week 17, this famous saying has not come true this year. Contrariwise the major stock markets have broken their resistances and have been building their way up for entire May. Obviously, the phrases are not a basis for investment strategies. 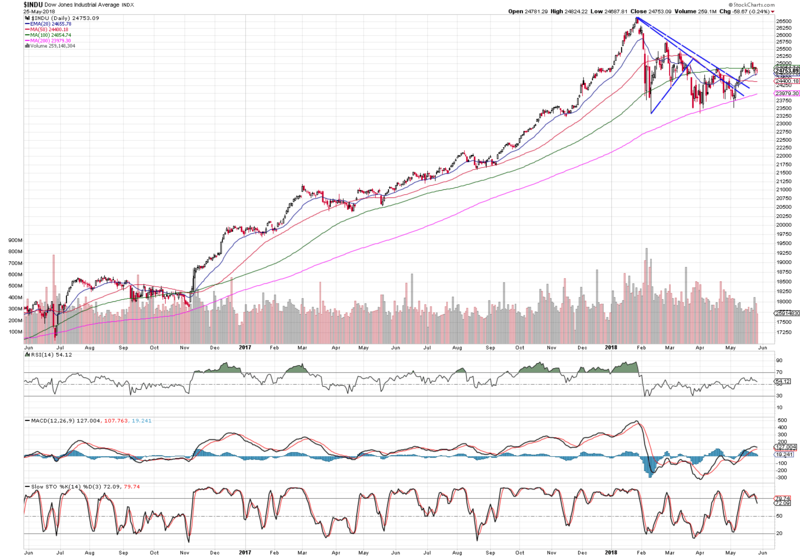 After S&P has broken from a descending triangle pattern, the index holds above so far. It may still test its new support reverting slightly back before it goes up again. Dow keeps fighting with 100 MA. This resistance needs to be pushed underneath before it can run up again. A strong trigger for such break is likely to be a cross of 20 EMA through 100 SMA. After the index broken its resistance (blue line) a steep rise occurred. 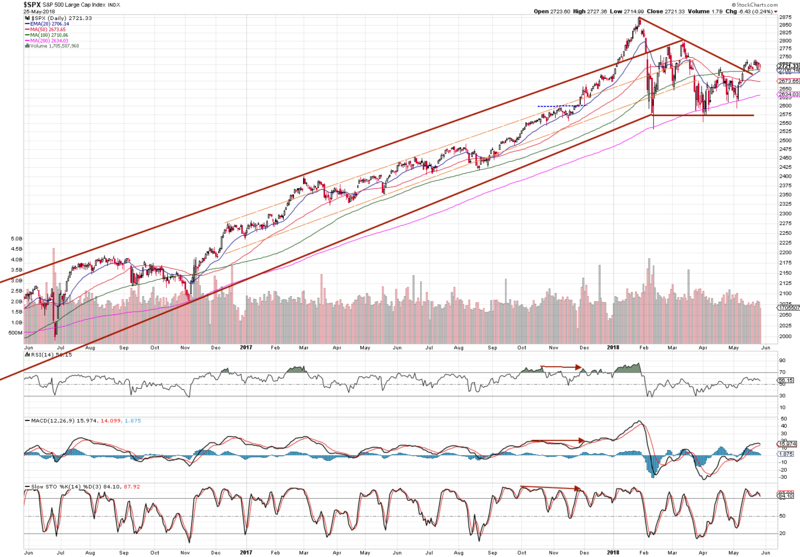 Then for a rest of a month Nasdaq has been consolidating and developing Flag Pattern. For successful completion, the price needs to break top of the flagpole and then it will continue to rise again. The UK’s index tested its highest high after fabulous and steep swing up. It didn’t hold above the resistance (horizontal red line) so far and thus, a consolidation in form of sideways trading is very likely to last in the following week. The financial markets are setting up for another bull run in long-term, however, some resistance still needs to be fought. Therefore, it is crucial to pick strong stocks to trade – companies with powerful fundamentals and bright technical setups.